In my last article, I wrote about mouse double-click tricks. In this tutorial, I will show you some amazing things you can do in Excel by using a combination of mouse and keyboard. Suppose you have three cells, and you want to shift the content of cell A1 to cell A3 (as shown below), how would you do it? With the cell selected that you want to shift, press the Shift key on your keyboard. Left-click on the horizontal edge of the selected cell and drag it down. Leave the mouse button when you see a horizontal ‘I’ shaped thick line at the bottom of the destination cell. Note: You can use this trick to shift cells, rows, and columns. Considering the same dataset, as shown above, how would you insert a copy of a cell/row in the middle of the data set (for example, copy and insert cell A1 in A3)? With the cell selected that you want to copy, press the Control and Shift key on your keyboard. Left click on the horizontal edge of the selected cell and drag it down. Leave the mouse button when you see an ‘I’ shaped thick line at the top of the destination cell. Note: This trick works for individual cells, rows, and columns. Press Control key on the keyboard. With the Control key pressed, left-click on the tab name at the bottom of the workbook, drag it towards the working area of the worksheet (you would notice that a plus sign in a rectangle appears along with the cursor). Note: The position of the copy of the worksheet depends on where you leave the control key. Notice that there is a small black arrow (pointing downwards) when you drag the cursor. It determines the position of the worksheet copy. Suppose you have a dataset as shown below, and you have to insert columns as indicated. Select the columns one after the other (keep the Control key pressed while selecting). 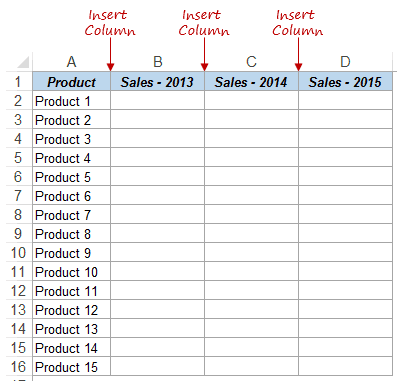 Right-click on the column header and select Insert – this will insert one column for each of the selected columns. Right click at the edge of the selection, move it a little to the right, come back to the original position and leave the right click. Magically, a menu appears, which you can use to converts formulas to values. These are my top five keyboard and mouse tricks in Excel that I use all the time. Share your favorite keyboard/mouse tricks with me. Recommendation: If you work with a mouse a lot, it makes you susceptible to wrist pain and other issues such as carpal tunnel. I recommend you get yourself an ergonomic mouse to minimize wrist pain. I have been using one for the past 3 years and I find these really effective. 20 Excel Keyboard Shortcuts that will Impress Your Boss. 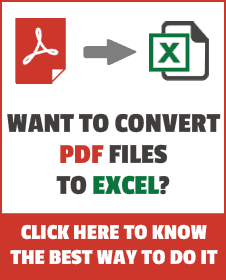 Excel Mouse Double Click Tricks. Strikethrough in Excel Cell – Keyboard Shortcut and Examples. I learn instantly usable tricks every time I open your emails, and indeed it does impress my boss and colleagues! Thank you! There is no faster way to execute a SUM than to capture a range and leave a space at the end. And press Sigma (SUM symbol). It’s instantaneous, with no suggestions or wasted time. It is equally useful for sums in restangular ranges: capture rectangular range of cells and leave spaces below and to the right. And press Sigma. Wonderful ! How can I run VBA code in the shared and protected workbook? Great job really. Sharing makes its the greatest. Great job. God bless you. We need good people like you in this world. Great expertize always impresses; that you are prepared to freely share your expertize is truly astounding! Is there an elegant way to change the sign of the values in a range of cells? I have tried multiplying the values by -1, but it leads to warnings of circular references. 3 common things I use included pressing the Alt and the equal sign for a quick Sum() formula. Highlighting a range and (first cell has a formula or value) and pressing Shft+Alt and an arrow key () to copy things left and right and then ctrl + D for down. The last feature is highlighting a range of numbers, hit F5, select special, blanks, and close. Then you can delete all blank cells. what software you use for creating gif video? Alt + F4 will reduce your stress in half. Do these work for Mac Excel as well?. Appreciate if you could also share some of them on Mac. Wow, I just noticed that your example above shows the same grayed out areas as mine (question above) If you checked out that link, you will see it was supposed to work differently, although I could not get mine to work. following their instructions. I guess I should have posted my question on that site (http://wmfexcel.com/2014/08/23/move-cells-by-right-click-drag-and-drop/) but that article was from 2014. You do not have to move your mouse pointer back. Select the cells you want to work with. While pressing ctrl move the mouse pointer over the edge of your selection [pointer will change to a +] Then ‘right-clikc’ and move the selection to a new range and let go of the mouse click. Presto – you copied to the new range with the full menu aailable. I tried this last tip from wmfexcel, but the bottom half (all of the shift commands) of my menu was grayed out. Can not figure out why. I even created a new worksheet with just a few cells filled in, but I get the same result. Also, do you know of a quick mouse shortcut to select entire continuous range from a single middle cell. I use ctrl+* but that is a little awkward and I have to take my hand off the mouse.